If you were to ask me when I first knew I wanted to visit the Himalaya I wouldn’t be able to answer the question. My dad has an old history of expedition climbing in the Himalaya. Stories of the towering peaks and welcoming Nepali people were often told when I was young. Prayer flags swayed in the wind outside our cabin in the Tetons and on the patio of our home in Salt Lake City. I have seen pictures of the famous mountain range throughout my whole life and visiting the area has been a lifelong dream. This past October I had the chance to lead a group of 8 women to Everest Base Group through the women owned travel organization Travel Her Way. Travel Her Way provides small affordable group tours to bucket-list destinations for women from all over the globe. They support sustainable tourism by employing local guides to support the local economy. Travel Her Way’s EBC trips work with the Volunteer Initiative of Nepal (VIN) to help provide a better life for the children of the Himalaya. For every trekking group that they bring to Nepal, the organization will cover a year’s worth of education for one child. The Travel Her Way EBC trek is a total of 12 days: 8 days up, 3 days down, with two days before and one day after in Kathmandu. Our group met up with our Nepali Coordinator and guide in Kathmandu before taking off for our flight to Lukla, where we would start our trek. Due to ever-changing weather and the dangers of Tenzing-Hillary Airport in Lukla flights are often delayed or canceled. Since our group was on a schedule we took helicopters to a small village below Lukla to begin our journey. We traveled by foot through a lush jungle forrest crossing multiple suspension bridges leading us through Sagarmatha National Park in the Northeastern part of the Himalaya. Each day required 5-7 hours of hiking through rocky terrain, narrow trails, dark shadowy forests, and windswept hillsides. Our steps on the trail were shared with porters, yaks, donkeys, cows, horses, dogs, and local Nepali people. Each morning in our tea house started out freezing but we warmed quickly as soon as our boots hit the trail. As we climbed higher and higher into the mountain range the air got thinner and colder. The sun was out for most of the trip but cold winds kept our faces flushed and jackets on. We lucked out with no serious weather or precipitation the whole trip but in a mountain range like the Himalaya it’s important to be prepared for anything. Packing for Nepal required specific pieces that would keep me warm, dry, and smelling somewhat decent since I sweat a ton. I am picky when it comes to stuff I buy because I really don’t shop that often anymore. When I’m shopping for new gear for a specific outing or trip I try to look for pieces that are versatile and can be used for many different activities. As an avid outdoor enthusiast I have trusted Backcountry.com for quality, well-priced outdoor gear for years now. Whenever I have a specific question about gear or the fit of something the Backcountry Gearheads have always been super helpful. Below are some of my favorite essentials that you can find on Backcountry for trekking to Everest Base Camp. For 15% off your first purchase use code ALI15! Code expires 12/31/18. I had been wanting to get an Arc’teryx jacket for a while because I’ve heard so many good things about how waterproof they are and as a backcountry skier living in the PNW I have found it hard to find gear that is breathable, keeps me dry, and holds up. The Arc'teryx Beta AR Jacket met all of my needs and packed up perfectly for Nepal. The Gore-Tex Pro shell has fully taped seams, DWR treatment, and the shoulders and forearms are reinforced with abrasion-resistant N80p-X Gore-Tex Pro. It features a helmet compatible hood, extra large pit zips, and higher hand pockets for easy access while wearing a harness or pack. This is my second pair of the Mountain Hardwear Women's Chockstone Hike Pant. Stretch combined with durability make these pants ideal for any adventure. Pants with good pockets are necessary in my life and these one feature multiple pockets with a zipper closure making sure my chapstick doesn’t fall out. When switching to sandals or slippers the cinch cord at the ankle is super helpful in preventing the pant legs from dragging or getting caught on things. The Deuter ACT Trail Pro SL 38L Backpack is a women-specific pack with breathable hollow-chamber foam pads, excellent support, cushioned shoulder straps, and an auto-compress waist belt with zipper pockets. It also features a top lid with pocket, zippered front access, detachable rain cover, and it’s hydration-compatible. 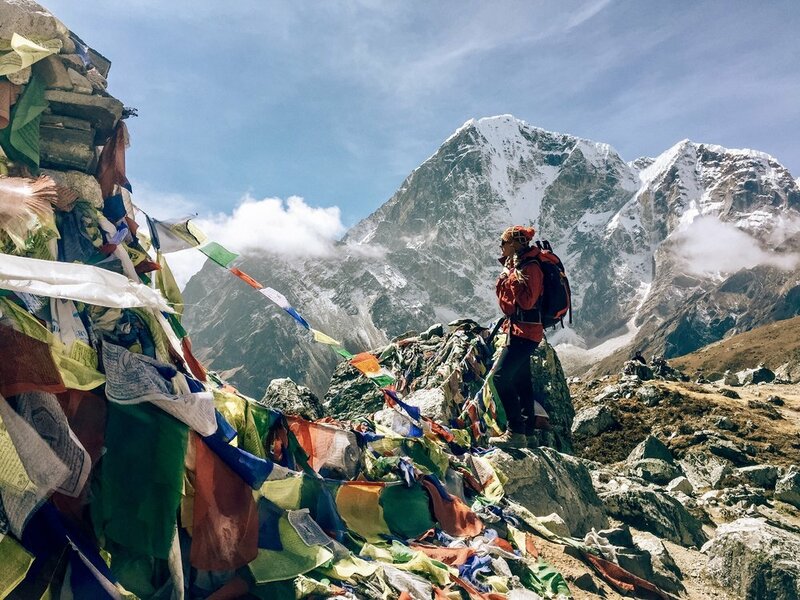 If you’re trekking with a guide you will most likely have a porter that will carry a duffle with most of your belongings so you don’t necessarily need a pack this large to trek to base camp. After the trek I headed to the lakeside town Pokhara and I left my duffle in Kathmandu so this size was perfect for my whole trip. Spolier alert: the Himalaya are at pretty high elevations. Trekking at high elevations means you are more exposed to UV rays and are at greater risk of UV-related eye damage. The Sunski Treeline Polarized Sunglasses have polarized lenses to protect and eliminate glare from blinding snow and the bright Nepali sun. They also have removable ventilated side flaps that keep the sun from sneaking in through the corners of your sunnies. Safe drinkable water is not free in Nepal. The only way to get clean water is to buy it or bring a water filter. The higher elevation you get on the trek the more expensive water gets. Everything has to get trekked into the Himalaya and the majority of trash is not trekked out. Save money and the planet by getting a good filter instead of buying plastic water bottles. 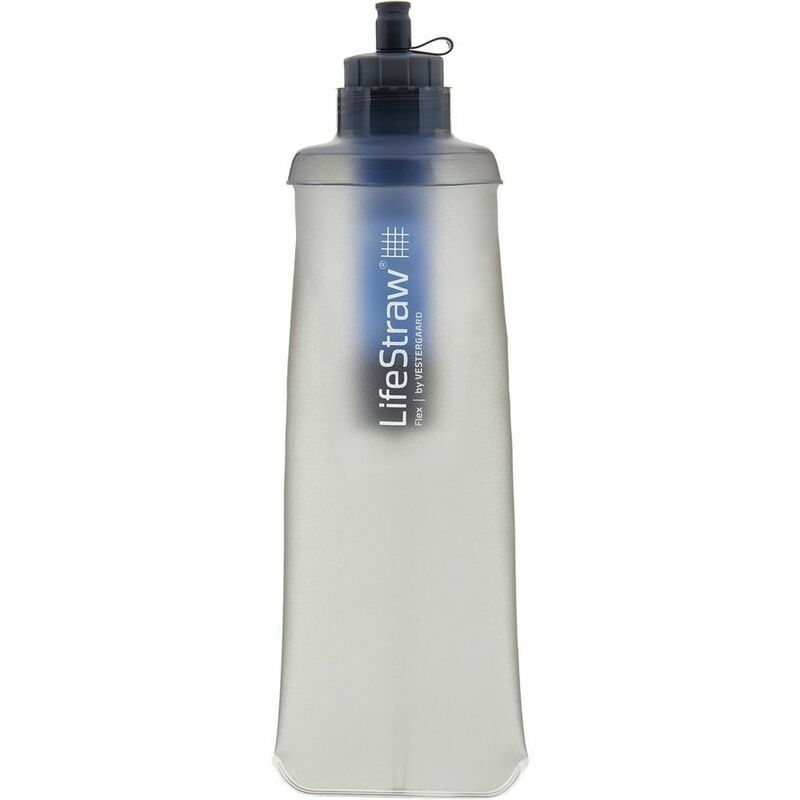 The LifeStraw Flex 2-Stage, Multi-Function Water Filter System is easy to use and super lightweight. It also adapts to hydration bladders and other water bottles. Big thanks to Backcountry for sponsoring this blog post and supporting my trip to Nepal.